PRICE JUST RECENTLY REDUCED! A MUST SEE EXLUSIVE! 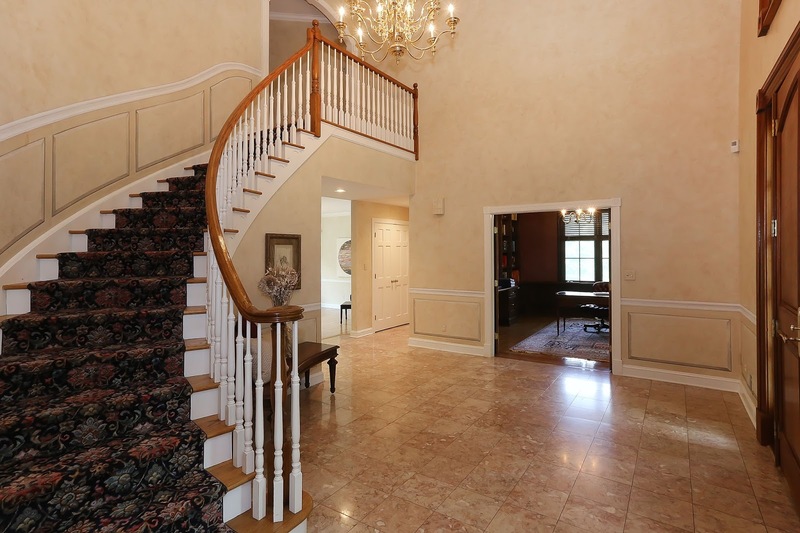 This Exclusive, Private Custom Estate is located in Bernard Township’s desirable Liberty Corner neighborhood with a prestigious Far Hills Mailing Address. Conveniently located close to major highways and transportation with access to the Award-Winning Basking Ridge school system. Luxurious yet Comfortable & Inviting, every amenity is elegantly embraced in this Custom Manor Home. 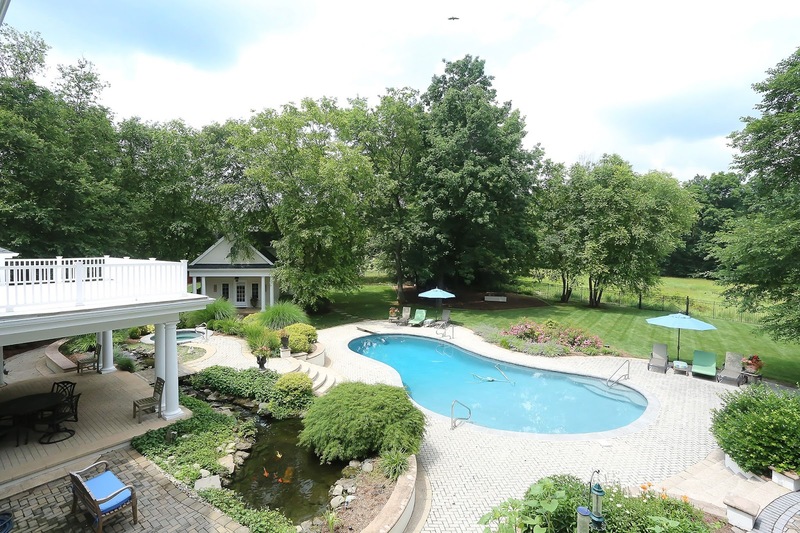 It rests on over 9 acres of Lushly Landscaped property with a separate Carriage House, a Beautiful Swimming Pool and Koi Pond in the back, and is surrounded by abundance of mature trees that produce a rainbow of color each autumn and privacy all year around. This custom-built mansion was designed with all the Elegance imaginable and boasts Impeccable attention to detail indoors and outdoors for Grand-scale entertaining and family living. The open floor plan offers Bright & Spacious rooms, 3 floors of Luxurious Living space, 3 Fireplaces, and Lovely Architectural detailing. This expansive residence first welcomes the visitor with a Circular Driveway and opens up to a Grand 2 Story Entrance Foyer with an Elegant Curved Staircase leading to the 2nd level. The foyer includes Gorgeous Marble Floors, Trompe l’oeil Box Moldings and Chair Railings, and a Chandelier. The Elegant Formal Living Room features Hardwood Floors, a Beautiful Fireplace with Custom Carved Mantel, Crown and Chair Moldings, Ceiling Medallions, and French Doors to the Private Backyard. Combining Elegance & Warmth, the Formal Dining Room with Lovely Wood Floors and Crown Moldings and Chair Railings is perfect for large dinner parties or intimate get-togethers. It also boasts Floor-to-Ceiling windows, Ceiling Medallion, and Built-In Buffet Table and Cabinets. An Impressive Family Room with Floor to Ceiling Brick Fireplace adds texture and warmth, providing wonderful space for relaxation & casual entertaining. It features Crown Moldings, Wood Floors, a Beautiful Ceiling Fan and Ceiling Medallion, and double doors that lead to the Resort-like Patio and Swimming Pool. An Exquisite combination of Beauty and Function, the Gorgeous Kitchen features Custom Cabinetry, Hardwood Floors, Crown Moldings, Designer Appliances including a SubZero refrigerator, a Center Island with Breakfast Bar, Tile Backsplash, and Pantry. Adjacent is and a Large Dinette area with Wood Floors and Crown Moldings. 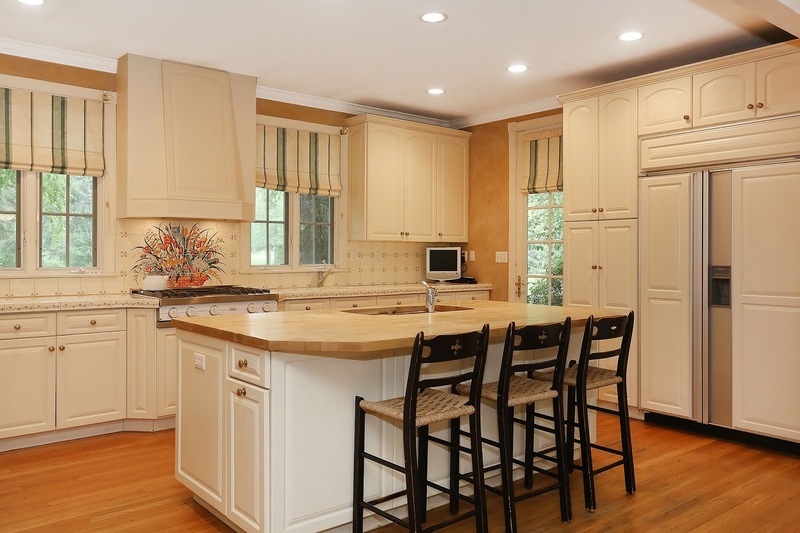 It boasts an open, easy layout for casual entertaining and meals. The 1st Floor also features two Powder Rooms and a Library with Crown and Box Moldings, Chair Railings, Chandelier, Wood Floors, and Huge Windows for lots of natural light. It also works wonderfully as an Office. An Attached, Oversized, 3-Car Garage completes the 1st Floor. Upstairs, a Spacious Master Bedroom Suite features Plush Carpeting & Vaulted Ceiling and opens to a Large Sitting Room with an Ornate Fireplace with Custom Cherry Mantel, Hardwood Floors, and Built-In Cabinets and Shelving. The master suite offers a Lavish Spa-like Master Bath with Cherry Cabinetry, Dual Vanities, Marble Counter Tops and Floors, Marble-Surround Jetted Tub & a Walk-in Shower. The 2nd Bedroom includes Wood Floors, Skylight, Ceiling Fan, and Built-In Shelving and Storage. The Spacious 3rd, 4th, and 5th Bedrooms also feature Wood Floors and Plenty of Space. 3 additional full baths and the laundry complete the 2nd level. The Full Finished Lower Level features a Carpeted Recreation Room with Built-In Bookcases, a Carpeted and Mirrored Exercise Room/Gym with Attached Full Bath, a Workshop, and Lots of Additional Storage. A Full Bed and the 2nd Full Bath would be an Excellent Suite for an Au Pair. Outside an Elegant, Spacious Carriage House boasts a 2-Story Living & Dining Area, Wood Floors, a Bedroom Loft with Vaulted Ceiling, and a Full Bath. The carriage house is the Perfect Retreat for Guests and Family. The back yard features a Resort-like retreat with a Large Paver Patio, Gazebo, Koi Pond, Heated In-Ground Swimming Pool, Whirlpool, fenced Garden with raised beds, and Lush Landscaping. A Stunning Space to Relax or Entertain. Enjoy the Privacy and Scenic Views. You will Live & Entertain with Pride in this Beautiful Home!